Web 2.0 Professional Vocabulary - Check for understanding. Understanding the Vocbulary is a key to understanding. After completing your reading in chapter 2, take the following quiz. Open book is ok! How to set up your discussion forum and prompt. Click the image below to open a video tutorial on how to create your own forum. You are now in the Teacher Role. Things will look different! This mode allows you to create quizzes or surveys. 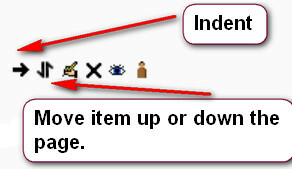 To create assessments you MUST Turn editing on by clicking button in the upper right hand corner! Remember you are the teacher role. You can organize your group area using the up/down arrows and the indent arrows. Groups can 'consistify' headings for clarity. It's your environment to arrange as you will. In order to take a classmate's quiz or survey, you must change your role back to Student. If you do not, you'll see the editing features for the quiz or survey, but you will not be able to take the quiz. Be sure to return to your normal role (teacher) when you have completed viewing the quiz or survey.